David Pepper, chairman of the Ohio Democratic Party was in Lima Tuesday night, speaking to local Democrats about the importance of the upcoming election. 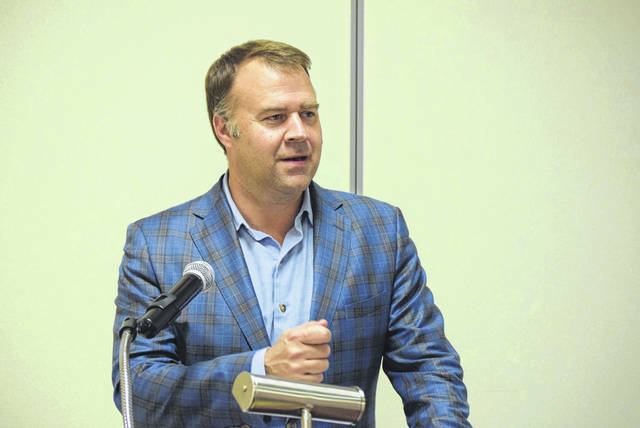 LIMA — The chairman of the Ohio Democratic Party took his message to Allen County Democrats Tuesday night at a fundraiser at the Lima Knights of Columbus Hall. David Pepper has been traveling the state to try and pump up their base. “If we turn the vote out, we can have a historic night for Ohio. We’ve been going around the state for two weeks in a bus, the side of which says ‘People First’ on it, and so our message is that there’s such a frustration in politics right now that whether it’s Columbus or Washington, the politicians seem to put everyone first but the everyday people,” said Pepper. Healthcare and education are big issues in the midterm elections. “We’ve watched Columbus for the last several years put a for-profit online charter school over the interests of our public schools and everyday people who send their kids to public schools. We’re seeing attacks on people’s healthcare, so the everyday concern about affordability and access is overlooked by a whole lot of the politicians because they’re going to bat for insurance companies, Mike DeWine being the best example, where in his first day as Attorney General he goes to court to stop the Affordable Care Act, which would have gotten rid of pre-existing condition protections. So our message is if you’re looking for people in politics, in public service, who put people first, from Richard Cordray to Sherrod Brown down to our candidates running for statehouse, we’re the ones who are on the side of everyday people fighting on the issues that they care about like healthcare, good schools, good jobs,” said Pepper. Pepper is convinced that the two parties are not so different. “Our attitude is it’s about everyday people in the communities of the state. You wouldn’t know it from the news coverage, but Republicans and Democrats agree on a whole lot. The first thing they agree on is that healthcare is the single biggest concern — access to it, keeping costs down, not undermining things like protection for those with pre-existing conditions, so we’ll fight for all those issues. Richard Cordray will, Sherrod Brown will, but when we do, my guess is most Republicans actually agree with that fight. Eighty percent of Republicans in one poll I saw disagree with the idea that people should be discriminated against because they have pre-existing conditions,” said Pepper. https://www.limaohio.com/wp-content/uploads/sites/54/2018/10/web1_DEMS-TONED.jpgDavid Pepper, chairman of the Ohio Democratic Party was in Lima Tuesday night, speaking to local Democrats about the importance of the upcoming election.